During Q2 this year we have several lease returns and trade-ins that any calibration lab or metrologist will be interested in. Fluke calibration gear is known for longevity, reliability and accuracy. Ask any metrology technician which brand they prefer and Fluke is most always the response. 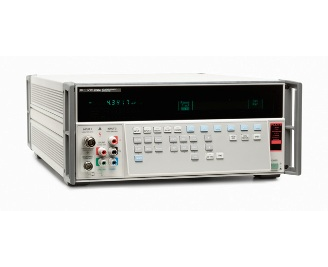 One of the best second hand buys is a refurbished Fluke bench top calibrator, because calibration equipment in general has spent its life in a clean operating environment, usually calibrated annually, and always well taken care of. Since these devices are used to repair and calibrate other products, they are coveted and looked after properly to avoid the duplication of erroneous test results. First up is the Fluke 8508A with option 01. This is an 8.5 digit digital reference multimeter tool specifically designed for use in a metrology environment; obviously not you’re your typical low-end multimeter. Option 01 adds ratio measurement functionality and rear binding posts in addition to the standard set of front binding posts. Very user friendly and feature packed for the most demanding analysis called for by such standards as ISO 17025. The industry standard Fluke 5500A can be found in most any reputable lab on any corner of the globe. When these come into inventory off rent, they go out pretty fast. So if you are looking to save thousands of dollars off list price contact us today. This innovative calibration solution really set the industry standard for multi functionality at a reasonable price. If you are an independent calibration facility our lease to own program can get the technology you need into your hands now, so you can generate immediate profits while spreading your costs over time. Perfect for on site calibration as well, should you offer on premise services for the convenience of your customers. If you are providing analog calibration services, then the Fluke 5080A is a reasonably priced niche solution. This product’s built in protection circuitry is vital to avoid damage from reversed input voltage, and protects the calibrator’s output terminals from extensive damage that could result from improper use. Although not as popular as the 5500A, the Fluke 5080A is actually quite rare to be found in the secondary market, but we have one currently available. Lastly, I would like to bring the Fluke 5720A-03 to your attention. We have a consignment unit with option 03, which adds wideband AC voltage capability to this high-end calibration solution. This is a wide bandwidth extremely fast calibrator, with more functionality than the other units previewed in this article. The 5720A is commonly used in conjunction with the Fluke 5725A, 5205A, and 5215A amplifiers to significantly extend its capabilities. Naturally we have these amplifiers should you test needs call for them. Many of these featured products are the more popular calibration solutions we carry, but we also sell hand held calibrators and other smaller budget friendly calibration solutions as well. When you need any type of calibration gear please contact us for a consultation.